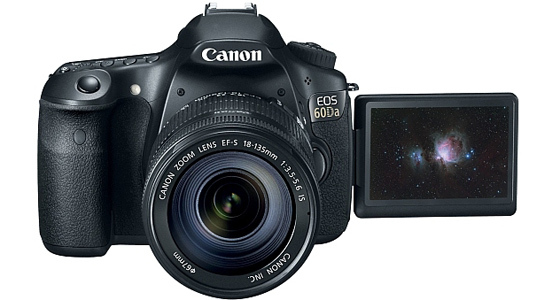 If Brian Cox is in the market for a new camera, something tells us he will probably be looking at the Canon EOS 60Da - a DSLR designed specifically for astrophotography. Canon have used a modified low-pass filter which sits in front of the camera’s 18-megapixel CMOS sensor and makes it more sensitive to infrared light. Based on the popular EOS 60D camera (as the name would suggest) the camera benefits from enhanced sensitivity to H-a long-wavelength light. For the less scientifically-minded out there, that means an improvement in recording of infrared phenomena, such as diffuse nebulae, by approximately three times compared to EOS 60D. "The EOS 60Da is a testament to the constant desire to meet the needs of every customer, including those in specialized fields," said Yuichi Ishizuka of Canon U.S.A.
"This new camera enables an accurate depiction of a part of our solar system which is hard to achieve with conventional cameras but should be enjoyed and celebrated."